The HighFinesse/Ångstrom WS8 is the unsurpassed high-end instrument for wavelength measurement of pulsed or continuous laser sources. It delivers superb absolute and relative accuracy required by cutting-edge scientific research, as well as industrial and medical applications. 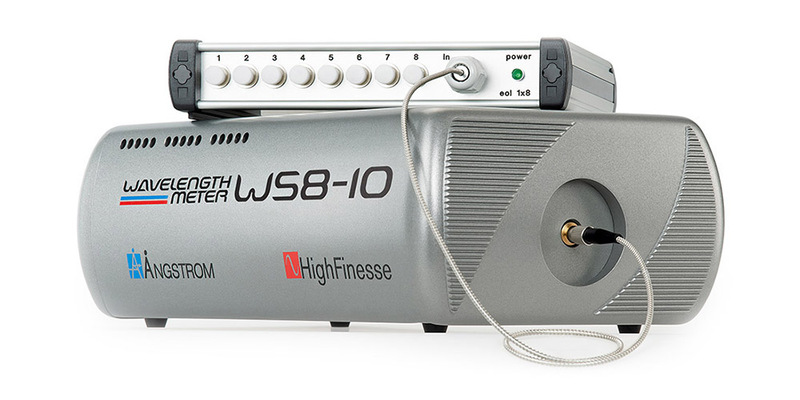 The unmatched precision of the WS8 series demonstrates the world leadership of HighFinesse-Angstrom wavelength meters. The WS8-10 is a high-end solution for wavelength monitoring and control with an absolute accuracy of 10 MHz and a wavelength deviation sensitivity of 0.4 MHz. It perfectly combines with the photonic crystal switch, enabling multichannel operation in the spectral range of the wavelength meter. The superior photonic crystal fiber technology is necessary for the high accuracy operation of the WS8-10. The 10 MHz presumes, that the device is supported by one of our calibration sources. We strongly recommend the superior photonic crystal fiber technology for versatility reasons.